The principle behind cell phones, transmitting waves modulated with sound signals was first seen in radio communications developed in the 1920s. However the potential of this technology was not realized for many years, and the move towards the networks used today did not begin until 1947, when Bell Laboratory engineers Douglas Ring and Rae Young proposed using hexagonal grids with base towers at the corners (rather than in the centers) to allow communication. This creation of the "cellular concept" resulted in increased research into the possibility of evolving commonly used 2-way radio communication into real time speech. California, Connecticut, District of Columbia, New York, New Jersey and, beginning July 2008, Washington ban the use of hand-held cell phones while driving. Cellular phones connect to distributed towers holding transceiver cells. 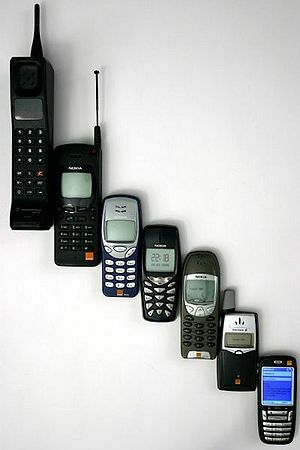 Each phone can operate on about 1,664 different channels. Territory is divided into cells—sections serviced by a specific tower. As a phone passes from one cell to another, its connection is switch over to the tower responsible for the newly entered cell. Each cell is usually a hexagon which covers about 10 square miles. Cellular phones use a number of different codes to identify themselves and the user's account, and function on the network properly. These include the following. SID System Identification Number Identifies the service carrier network uniquely, enabling connection to the correct network as well as roaming, if permitted. There have been some studies which suggest cell phone might cause cancer, especially in the brain. The World Health Organization was perhaps the first world-recognized organization to announce this possibility. At the very least, it is known that the radio waves from cell phones do effect the cells nearby, as is evidenced by the change in their metabolism rate of glucose. However, no cell phone cancer link has been proven beyond doubt. (Also see: Mobile phones and brain tumor risk). In the United States, the FCC limit for public exposure from cellular telephones is a Specific Absorption Rate (SAR) level of 1.6 watts per kilogram. In most cases, cell phones are tested for safety with the assumption that they are operated between 5mm and 15mm from the body. 10 Commandments of Cell Phone Etiquette Christopher Null. Six Ways Cell Phones Can Hurt Your Business Christopher Null. This page was last modified on 26 September 2018, at 09:38. This page has been accessed 18,948 times.